I love pistachios. I could sit down and eat an entire bag of pistachios, but because I know I shouldn’t do that, I try to create foods that are portioned out, and delicious. 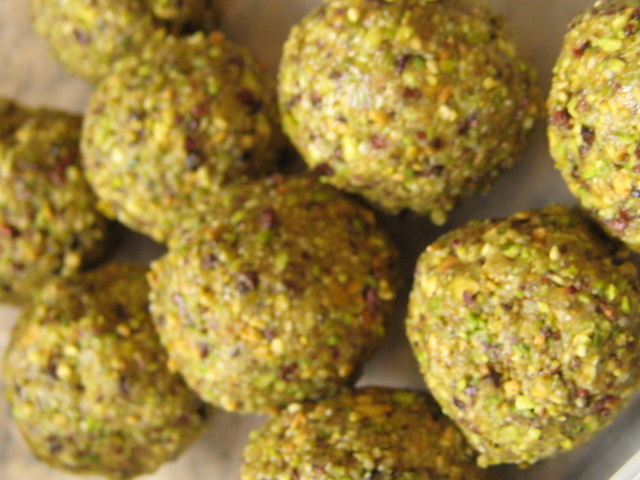 The other day I was hungry for a tasty treat and decided to make these chocoalte-pistachio balls. It took me 3 minutes to make these magical balls. ¼ C coconut oil – if you want that coconut flavor. In a food processor, process cacao butter to break the butter down into a powder like consistency. Add coconut oil to butter and pulse for about 30 seconds. Add remaining ingredients until you have created a dough-like consistency. **If you soaked your nuts but did not have time to dehydrate them prior to making these balls, you can dehydrate your Mad Greens for 8-12 hours at 115 Degrees, or until reaching the texture you like.